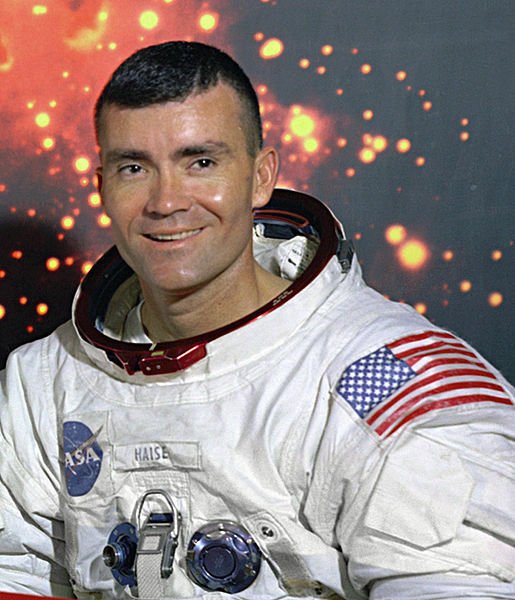 Fred Wallace Haise, Jr.was born in Biloxi, Mississippi, USA on his day in 1933. He is 79 years old. After being honorably discharged from the service –Haise went from the Cadet Program to the Marine Corps, served a tour of duty, then went into the Air National Guard — he got his BS in aeronautical engineering from the University of Oklahoma. While in the Oklahoma Air National Guard he was introduced to the idea of becoming a NASA research pilot. He was very interested, but the queue at Langley, Ames and Edwards Air Force Bases — NASA’s premier flight test centers at the time — was long. So Haise opted for Lewis Research Center. 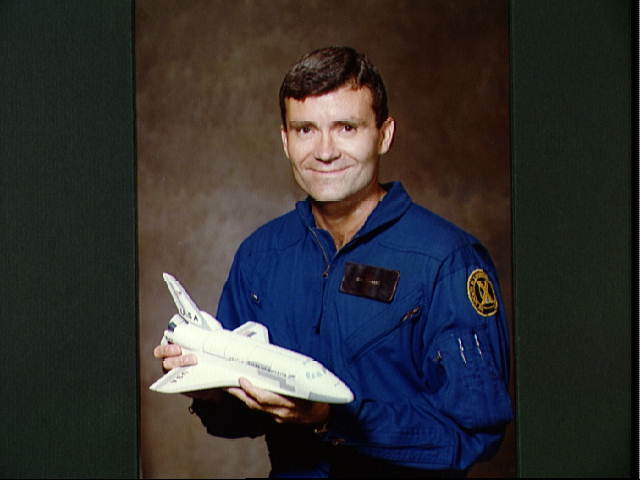 He worked for 7 years before entering the NASA astronaut program as a research pilot. This was the same path Neil Armstrong had taken three years ahead of him. He was part of the “Original 19” astronauts, nine of whom flew in the Apollo program and eight of whom flew in the Shuttle Program. Haise did both. He was a the back up Lunar Module Pilot for Apollo 8 and Apollo 11 and the back up commander for Apollo 16. But the flight he is best remembered for is Apollo 13. Apollo 13 was slated to go to the Fra Mauro region of the Moon; deploy “a set of scientific experiments involved in the ALSEP [Apollo Lunar Surface Experiments Package] packages” [Ibid] and do field geological work while on EVA. The mission took off from Kennedy Space Center, Florida on April 11, 1970. The crew included Commander by James Lovell, Lunar Module Pilot, Haise and Command Module Pilot, Jack Swigert. Swigert was a last-minute replacement for Ken Mattingly who was exposed to the measles and pulled off the primary crew a week before take off. He quickly went to his station where he encountered an “array of warning lights.” [Ibid] Haise looked at an instrument panel that read the pressure, temperature and quantity of the oxygen tanks. One had the needles at the bottom of all three gauges. They had lost an oxygen tank, and, according to Mission Rules, that meant they had lost the Moon. They were now in abort mode. Still, the situation didn’t seem life threatening. But after a few minutes it became evident that the second oxygen tank– the remaining tank — was also leaking. The crew transferred to the smaller Lunar Module. Power and consumables were the first concern, but another danger, Carbon Dioxide, proved a hidden foe. To navigate back to Earth the space craft was put on a free-return course that required two burns of the engines. The first burn lasted 35 seconds and occurred 5 hours after the explosion. The second burn was 5 minutes and took place as they approached the Moon. Amazingly the three men in the capsule and the hundreds of people back at Mission Control were able to get the space craft back to Earth safely. 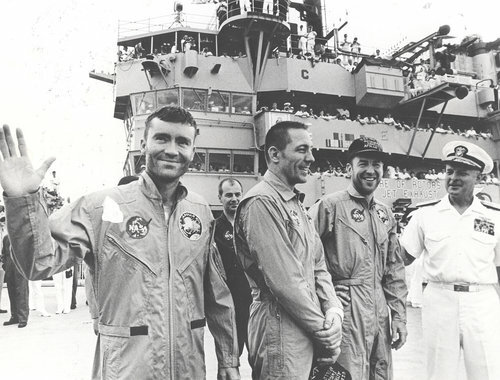 Apollo 13 splashed down near Samoa on April 17, 1970. After Apollo 13 both Haise and Swigert had hopes of being assigned another Moon mission, but that did not come to pass. (Swigert went on to become a member of the House of Representatives from Colorado in 1982 before dying of bone cancer.) Haise stayed with NASA and worked on the Shuttle program. 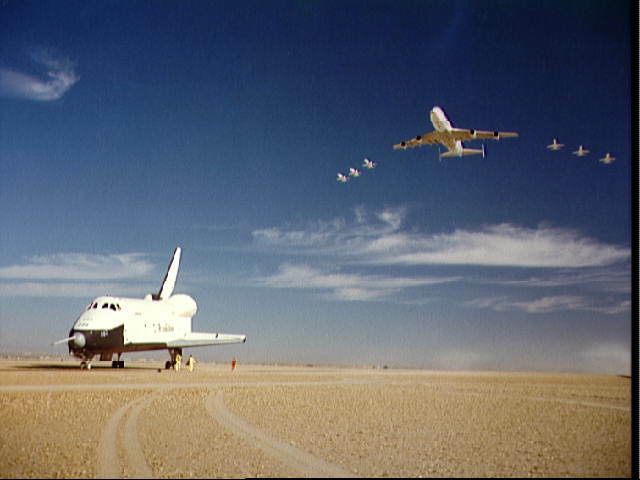 There were a total of 8 “piggy back” flights that tested the Shuttle’s critical glide, approach, landing, rollout, and flare capabilities. After resigning from NASA in 1979 Haise became VP of Space Programs at Grumman Aerospace Corporation. This entry was posted on Wednesday, November 14th, 2012 at 9:08 pm	and tagged with Apollo 13, Fred Haise, NASA and posted in American History, Fred Haise, NASA, Neil Armstrong, postaday, Science, Space, Thought of the Day, Today's Birthday, United States. You can follow any responses to this entry through the RSS 2.0 feed. Very excellent words about Fred Haise. I had the pleasure of meeting him a couple of times during the shuttle approach and landing tests at Edwards AFB in 1977. I was 19 years old and in college at the time, and on my way to an air force career. I have a very vivid memory of watching Fred Haise fly. It was during the first free flight of the shuttle Enterprise (it had been carried aloft and then released by the 747). We were all sweating the flight, for the shuttle had never flown on its own before, and it was pretty darned big for a glider! It flew perfectly, and as we watched it approach the runway, all of us were shouting encouragement such as, “Way to go, Fred! You got it, Fred! Beautiful, Fred!” However, none of us, having any experience with gliders, let alone a 100-ton glider, didn’t realize that it was standard practice on such flights not to put the wheels down until just seconds before touchdown (the wheels cause a lot of aerodynamic drag and can cause an airplane to land short if deployed too soon). Soon our happy cries turned to cries of concern. “Wheels, Fred! Put the gear down, Fred! Let’s see some gear, Fred!” He did indeed put the wheels down, but only seconds before they touched the lakebed. We learned that day! One other memory was of the very final free flight in the 747 series. Haise was landing Enterprise on the concrete runway at Edwards AFB. Prince Charles was in attendance. We watched in fascination as the shuttle touched the runway, then bounced aloft again, and its wings began rocking back and forth. It touched a second time, bounced aloft again, before touching a third and final time. Haise later admitted with a wink that the shuttle had approached the runway a little too fast and was going to touch down beyond the spot where Prince Charles and the Royal party were waiting. He attempted to force the shuttle to land in front of the viewing area, but because it was “hot,” the bouncing and wing rocking ensued. The image of Enterprise zooming past me (we were only 500 feet from the edge of the runway), with its wings rocking and tires spinning from the first touchdown, is burned into my memory to this day, clears as can be. I recall thinking as the shuttle sped past, “Hey, that looks like one of *my* landings!” Needless to say, at the press conference following the flight, he took a lot of ribbing, and winked as he said he had been trying to impress Prince Charles, a fellow pilot. Thank you for a great retrospective on Fred Haise, a very distinguished test pilot and astronaut.